High protein diets can help you lose weight while maintaining muscle mass. This should make them the ideal choice of diabetic patients, many of whom are suffering from weight issues that are often not corollary, but rather causatively involved in the development of type II diabetes. Unfortunately, studies in type I diabetics and preliminary evidence from type II diabetics and other insulin resistant individuals suggests that - if the disease has progressed significantly - eating too much protein can be a problem, as well, one that may worsen the ill effects of diabetes. Having high amounts of protein after fasting may ruin your glucose levels?! Fasting Works - It Does, Right!? The reason for the potentially detrimental effects of high protein intakes on glycemia is well-known, but rarely acknowledge: gluconeogensis. As early as in the 1970s, researchers observed that the administration of a high-protein diets to rats, can significantly elevate plasma glucose and insulin concentrations and reduce the sensitivity of fat cells to insulin (Blazquez. 1970). 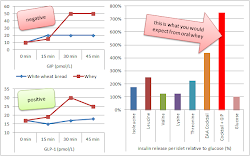 Figure 1: Post-prandial insulin and glucose levels in rats after several weeks of high protein feeding (Blazquez. 1970). Over the decades after the publication of the Blazquez study, evidence for both the beneficial (Tremblay. 2007) and potential ill effects (Unger. 1971; Eisenstein. 1974) of high protein diets on diabetes and insulin resistance has been accumulating (Linn. 2000). Sign. 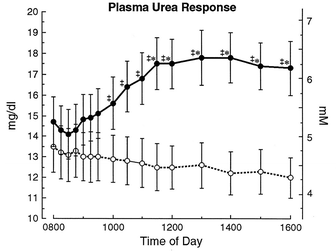 increases in urea prod. are another consequence of protein-based gluconeogenesis (Gannon. 2001). As usual you will find conflicting evidence: In 2001, for example, Gannon et al. found only a modest increase in serum glucose levels in type II diabetics in response to the ingestion of 50g of protein - in spite of the fact that ~20-23g of it were converted to glucose in the liver. What is important to note, however, is the fact that the protein source in the Gannon study was lean beef - one of the slowest sources of protein you can have and thus not exactly the #1 candidate for being subjects to immediate and thus glucose raising gluconeogenesis. Now, back in the day these observations were mainly used to support the concept of a "protein sparing action" of glucose. Today, the effect on gluconeogenesis, i.e. the production of glucose from proteins / amino acids in the liver, has moved to the center of attention of a number of scientists. Calbet and MacLean, for example, investigated how the plasma glucagon and insulin responses of humans would depend on the rate of appearance of amino acids after ingestion of very fast vs. fast protein sources. Figure 2: Glucose and glucagon levels in the blood of healthy volunteers after ingesting either 25g glucose or protein solutions containing whey protein hydrolysate (WPH), pea peptide hydrolysate (PPH) or milk protein (MS | Calbet. 2002). Their results (see Figure 2) indicate the obvious: Even in healthy individuals and even upon co-administering protein sparing and 25 g of anti-gluconeogenic glucose, the fastest protein sources (whey protein, WPI; pea peptide hydrolysate; PPH) produce the highest increase in glucagon, gluconeogenesis and thus serum glucose levels in the first 20 minutes after the ingestion of the 25 g of glucose plus ~30g of the different proteins. Let's just be clear here: I am not saying that high protein diets cannot help with diabetes. I am just saying that bolus intakes of protein can be problematic for type I diabetics and people with severe insulin resistance and progressive type II diabetes. What may not be a major problem for healthy individuals, though, can be a deal-breaker for diabetics, in whom studies into the inter-organ flux of substrates after a protein-rich meal (slow digesting beef 3g/kg body weight) show that the normally non-significant effect on glycemia (<5% in healthy subjects) was exuberant in the diabetic subjects in whom you will see a greater rise in blood glucose, and a three-to-fourfold increment in splanchnic glucose output at 30-90 min that was triggered by a doubling of arterial glucagon, which was not compensated for by an concomitant increase in insulin as it occurred in the healthy test subjects (Wahren. 1976). Figure 3: Rel. changes in blood glucose after ingestion of 3g/kg lean meat in healthy and diabetic subjects (Wahren. 1976). Whether an increase in protein intake will have beneficial or ill effects on your ability to control your glucose levels will thus clearly depend on the degree of hepatic insulin resistance / pancreatic dysfunction you expose. If you are severely diabetic and/or insulin resistance, i.e. you either don't produce enough or no insulin in response to the ingestion of protein or your body does not react to the insulin, as it would be the case in type I diabetes and progressive type II diabetes, your glycemia may be impaired by high protein meals. If you are only slightly insulin resistant, you will probably benefit from the insulinogenic effects of protein and the ability to replace carbohydrates in your meals with protein. You may nevertheless want to test your individual glucose response to fast-digesting proteins like whey or amino acid supplements, which may still result in an uncontrolled gluconeogenic response. If you are healthy and insulin sensitive, you won't have to worry about the gluconeogenic effects of high protein intakes - regardless of whether we are talking about fast or slow protein sources, because the former will spike insulin enough to blunt any pro-gluconeogenic effects of the concomitant increase in glucagon to keep the rates of gluconeogenesis and thus your glucose levels in check. So, just as you've read it here at the SuppVersity before, what's good and what's bad for your cannot be generalized - even when it comes to something as popular as increasing your protein intake. What do you have to remember? High protein intakes, especially in form of large bolus intakes of 30g or more protein per session can trigger unwanted glucose excursions. These problems with glucose management occur almost exclusively in diabetics, in whom the protein-induced increase in insulin and / or the effects of this increase in insulin is / are blunted. Due to the unavoidable protein induced increase in glucagon, diabetics and people with severe insulin resistance will fall into a catabolic state in which the lions share of the protein they ingest will be subject to gluconeogenesis, i.e. the production of glucose from proteins / their amino acids in the liver. 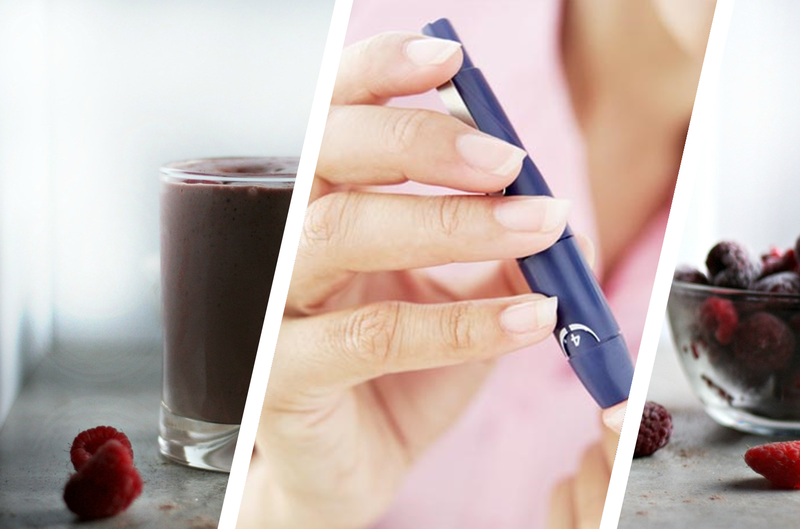 The consequence of the skyrocketing rates of gluco-neogenesis is an increase in blood glucose that will only exacerbate the existing damaging effects of elevated glucose levels in diabetics and people with severe insulin resistance. Since the of gluco-neogenesis depends on the rate of appearance of amino acids in the blood, fast-digesting proteins like whey are more prone to trigger this effect than slow-digesting proteins like meat. If you don't belong to the previously referred to group of people suffering from type I or severe type II diabetes and/or severe insulin resistance, though, you don't have to worry that high(er) protein diets could mess with your ability to manage your glucose levels | Comment on Facebook! Blazquez, E., and C. Lopez Quijada. "The effect of a high-protein diet on plasma glucose concentration, insulin sensitivity and plasma insulin in rats." Journal of Endocrinology 46.4 (1970): 445-451. Calbet, Jose AL, and Dave A. MacLean. "Plasma glucagon and insulin responses depend on the rate of appearance of amino acids after ingestion of different protein solutions in humans." The Journal of nutrition 132.8 (2002): 2174-2182. Chevalier, Stéphanie, et al. "The greater contribution of gluconeogenesis to glucose production in obesity is related to increased whole-body protein catabolism." Diabetes 55.3 (2006): 675-681. Eisenstein, Albert B., Inge Strack, and Alton Steiner. "Glucagon stimulation of hepatic gluconeogenesis in rats fed a high-protein, carbohydrate-free diet." Metabolism 23.1 (1974): 15-23. Gannon, M. C., et al. "Effect of Protein Ingestion on the Glucose Appearance Rate in People with Type 2 Diabetes 1." The Journal of Clinical Endocrinology & Metabolism 86.3 (2001): 1040-1047. Linn, T., et al. "Effect of long-term dietary protein intake on glucose metabolism in humans." Diabetologia 43.10 (2000): 1257-1265. Tremblay, Frédéric, et al. "Role of dietary proteins and amino acids in the pathogenesis of insulin resistance." Annu. Rev. Nutr. 27 (2007): 293-310. Unger, Roger H. "Glucagon and the insulin: glucagon ratio in diabetes and other catabolic illnesses." Diabetes 20.12 (1971): 834-838. Wahren, J., P. H. I. P. Felig, and L. A. R. S. Hagenfeldt. "Effect of protein ingestion on splanchnic and leg metabolism in normal man and in patients with diabetes mellitus." Journal of Clinical Investigation 57.4 (1976): 987.